Q: Why did you decide to do a report comparing the marital status and offers of employer-based health insurance for employed women? RC: A recent study found that women were less likely than men to have been insured through own employer and more likely to have been covered as a dependent. This report describes the association of marital status and the presence of employment-based insurance offers among employed women in the United States. It is important to note, that the presence of an offer does not necessarily indicated take-up. Q: Is this the first time the National Health Interview Survey (NHIS) has released a report on this topic? If not, where is trend data available? RC: This is the first time that NHIS has released a report on the association of marital status and of offers of employer-based private health insurance coverage for employed women. Q: In general, how do offers of employer-based health insurance for employed women vary by marital status? RC: Marital status is an important predictor of having an offer of health insurance through employment for employed women aged 27-64. Married women may gain an additional opportunity for an offer of health insurance coverage through their spouse’s employer. 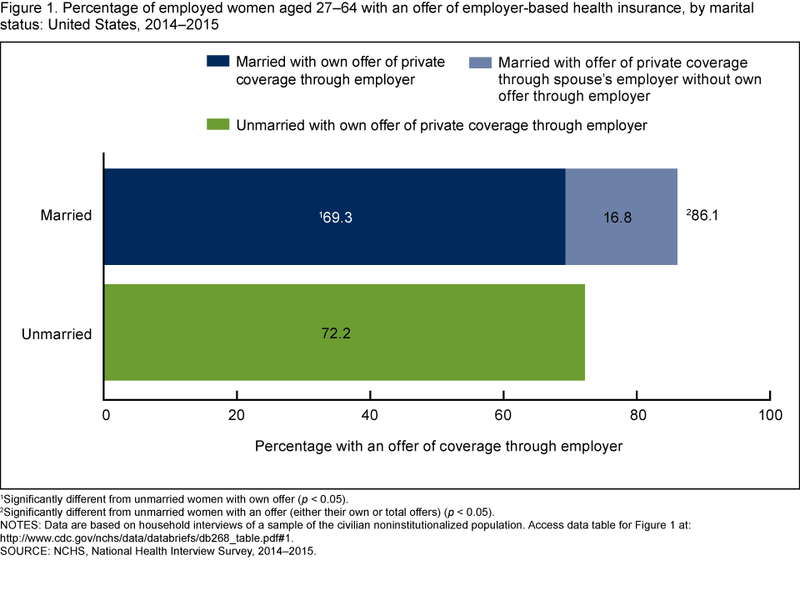 Therefore, taking all offers of health insurance into account, employed married women aged 27-64 were more likely than employed unmarried women to have an employer offer of health insurance. Q: How do offers of employer-based health insurance vary by marital status for employed women within categories of educational attainment? RC: Regardless of educational attainment, employed married women aged 27-64 were more likely than employed unmarried women to have been offered health insurance by their employer or their spouse’s employer. For both married and unmarried women, total health insurance offers increased as levels of educational attainment increased. Q: Do offers of employer-based health insurance vary by marital status for employed women aged within categories of race and ethnicity? RC: Employed non-Hispanic white and non-Hispanic Asian unmarried women were more likely than their married counterparts to have an offer of coverage from their own employer. However unmarried Hispanic and non-Hispanic black women were about as likely to have an offer of coverage from their own employer. This entry was posted on Thursday, January 12th, 2017 at 9:15 am and is filed under health insurance, Marriage and Divorce, National Health Interview Survey. You can follow any responses to this entry through the RSS 2.0 feed. You can leave a response, or trackback from your own site.